Emerging technologies are transforming every aspect of the insurance business. Property and casualty insurers are adapting InsurTech capabilities to be more customer-centric, to optimize costs, and to improve operational efficiency. 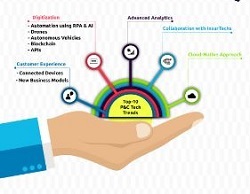 Transformational moves by P&C insurers include the use of connected devices to mitigate risk, exploring new business models, value chain process automation across using Artificial Intelligence (AI) and Robotic Process Automation (RPA), and blockchain (distributed ledger) technology. They are also leveraging drones for efficient property assessment, Application Programming Interfaces (APIs) for seamlessly integrating with other stakeholders, and advanced analytics to provide personalized offerings and improve underwriting operations. Most of the Insurers prefer to collaborate with InsurTech firms for inculcating InsurTech capabilities and for quick deployment and efficient maintenance of the new systems, they are focusing on a cloud-native approach.